Wanted for the Atria: Knitting needles, sizes 7-11, left over yarn, ribbons, and all occasion wrapping paper. Thank you very much. Level 1 Course: The dates are November 18th and December 16th (a change from the original of December 9th). Trinity is hosting a Catechesis of the Good Shepherd Level 1 Formation course for adults. 9:00 a.m. to 4:30 p.m. Participants from four states are currently attending, including two representatives from Trinity Church. A Loving Christian Community. Children will find positive role models in their teachers and good friends in their classmates. Stories and Symbols to Spark the Imagination. Children encounter the Scriptures, traditions and liturgies of the Church in fun and engaging ways. A Safe Place to Grow. Our lead teachers have completed the Episcopal Diocese of Massachusetts’ Safe Church training program, and we carefully follow Safe Church guidelines to protect every child. Freedom to Ask Questions. At every age level, children are encouraged to make the faith their own. Here at Trinity Episcopal Church in Randolph we are pleased to be opening three atria this year for each of the three levels in CGS. The Atrium of the Good Shepherd will welcome children from age 3 to 6, the Atrium of the True Vine will continue to host children from ages 6 to 9, and the Atrium of the Covenant will provide a dedicated space for children 9 to 12 for the first time. We welcome all children and all adults who wish to visit or become a part of this experience. Please come see our newly renovated spaces and contact Father Phil or Carol Godfrey. “The Catechesis of the Good Shepherd (CGS) is an approach to the religious formation of children for ages 3-12. It is rooted in scripture, liturgy, and the educational principles of Maria Montessori. God is already present to children in their deepest being. 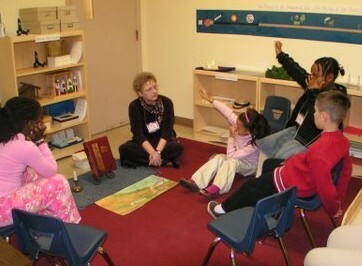 With guidance and vocabulary, children become aware of their relationship with God and give expression to it. For more information about our Sunday School program, or to enroll your child or adolescent in our Sunday School program, please use the contact form below.